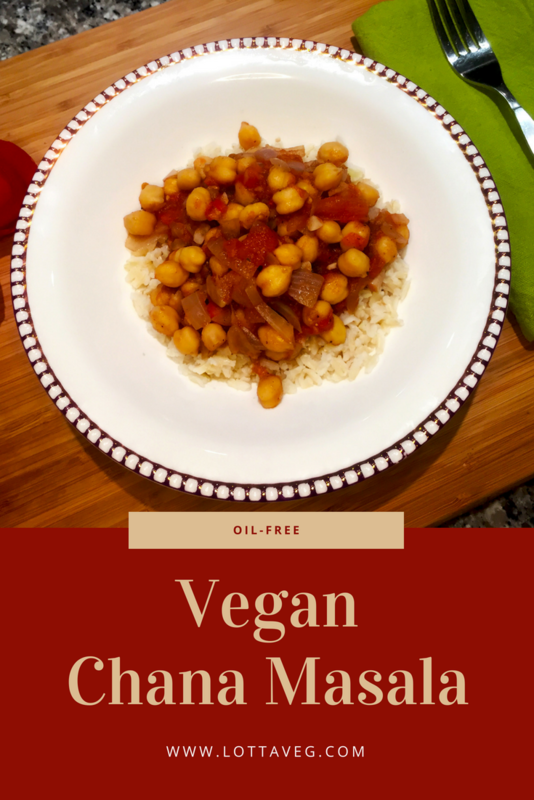 This Vegan Chana Masala recipe (made with chickpeas) was inspired by an Indian cuisine cooking class that we took at Baking Anis in Cuenca, Ecuador taught by two Chilean chefs. It’s such a small world! Amelia made our recipe oil-free and low-fat by sautéing with veggie broth instead of oil. This dish is a nutrition powerhouse with 15 grams of protein and 13 grams of fiber per serving. It’s also a quick and easy one-pot meal (not counting the brown rice, which we make in our pressure cooker). This Vegan Chana Masala recipe makes 2 servings with 1 cup per serving. We usually eat a Hearty Side Salad with it. 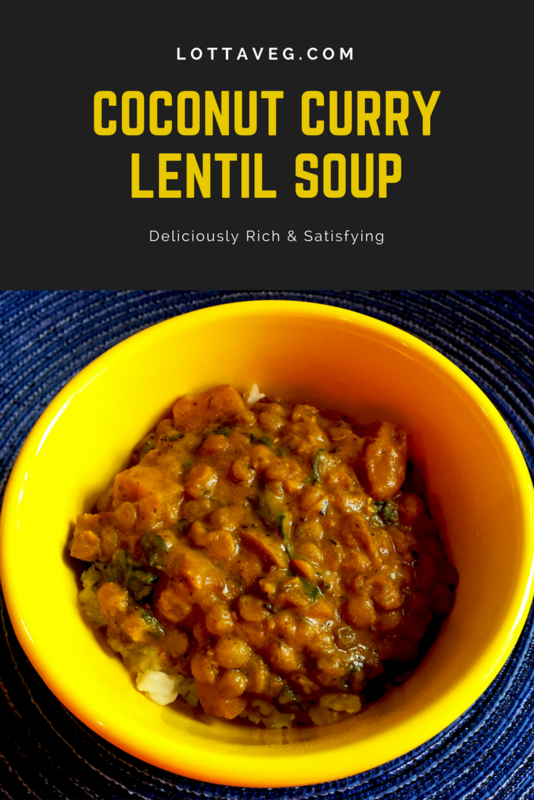 This Coconut Curry Lentil Soup recipe is a delicious Indian dish that will fill your kitchen with the savory aroma of curry. We love Indian food, and it’s one of the easier types of cuisines to eat at restaurants since they typically have lots of vegan/vegetarian options. But if you’re craving some curry, you don’t have to go out to eat. Now you can make your own! We served it over brown rice to make it a little more filling and to spread out the delicious flavor, but you can eat it plain without the rice to save calories. If you’re watching your saturated fat intake, you can also skip the coconut milk, but it won’t be as creamy or flavorful. We tried it without, but that seemed to be the missing ingredient. 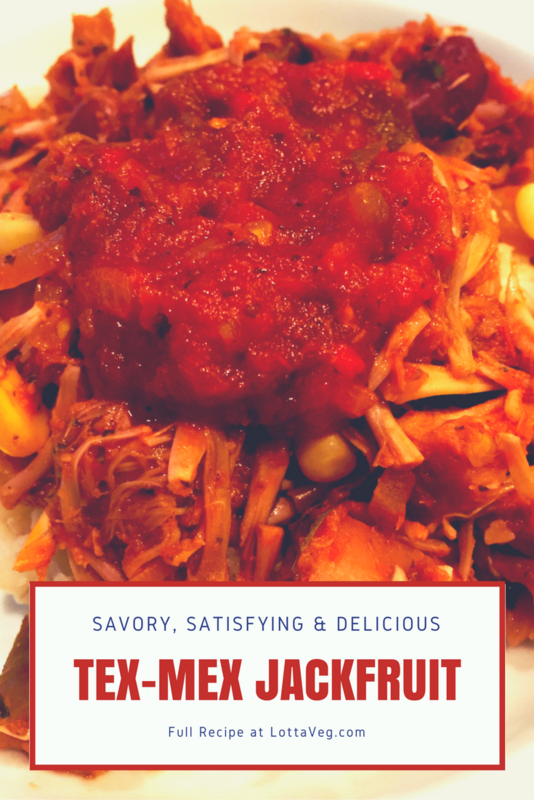 This Tex-Mex Jackfruit recipe is a veganized version of the old standard Tex-Mex Pulled Chicken. We served it over rice but it would go great wrapped up in a tortilla. It’s savory, satisfying and delicious! The key to getting the jackfruit to mimic the look and texture of pulled chicken is to steam fry it until it’s soft, and then use a fork to pull it apart. This will string-a-fy the jackfruit. Once you add in the remaining ingredients and serve it over rice or in a tortilla with some extra salsa, it’ll fool just about anyone. Our non-vegan family loved it! Amelia’s dad honestly thought it was chicken! He was shocked when we told him it was a fruit! A lot of vegans don’t like the idea of eating things that mimic meat, but if you’re trying to get someone to taste new cruelty-free foods, or you’re cooking for non-plant-based eaters, these types of recipes really help bridge the gap. They also show people just how tasty and creative plant-based foods can be. These Vegan Fajitas with roasted portobello mushrooms and sautéed onions and peppers is absolutely delicious, and very nutritious! Three corn tortillas topped with all the fixin’s has 450 calories, 11 grams of fiber and 17 grams of protein. Add to that: 70% RDA of Vitamin A, 315% Vitamin C, 76% Calcium and 24% Iron. And this doesn’t include the optional avocado, brown rice or refried beans! Looking at these stats for one vegan dish, it’s hard to understand how the protein and calcium deficiency myths gained traction and continue to be two of the most common questions vegans get asked. We used corn tortillas in our recipe because they’re made with only corn and water. They contain no refined flour or oil. Most flour tortillas we’ve found here in Ecuador have either oil or lard, and we haven’t found any whole wheat tortillas, so we opted for the healthier non-GMO corn tortillas. If you can find oil and lard free whole wheat flour tortillas, feel free to use those instead of corn. 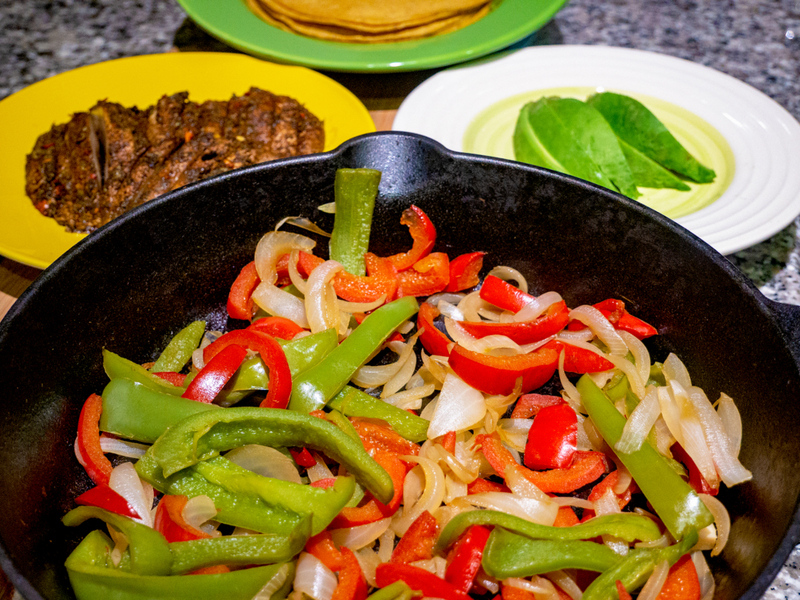 We like using my Grandpa’s Vegan Dipping Hot Sauce on our vegan fajitas, but you can use your favorite salsa. Just be sure to get a salsa without oil or a lot of added sugar, as most store-bought brands contain one or both. The avocado, brown rice and Refried Beans are optional since this is already a filling and high calorie meal without them. 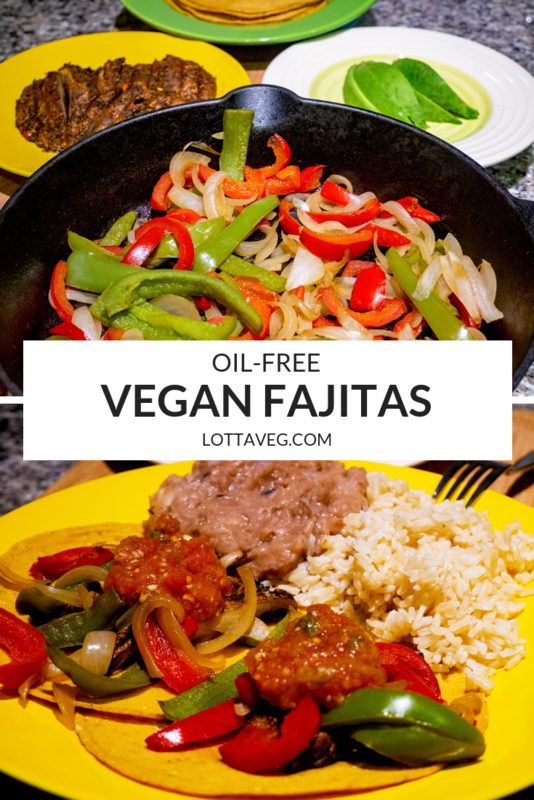 However, they make great companions for these Vegan Fajitas! These are also fantastic topped with a little Vegan Cashew Sour Cream! These Cauliflower Couscous Tex-Mex Tacos are a favorite in our household. They’re not only super fast and easy to prepare, but their also filling and nutritious with 10 grams of fiber and 8 grams of protein. 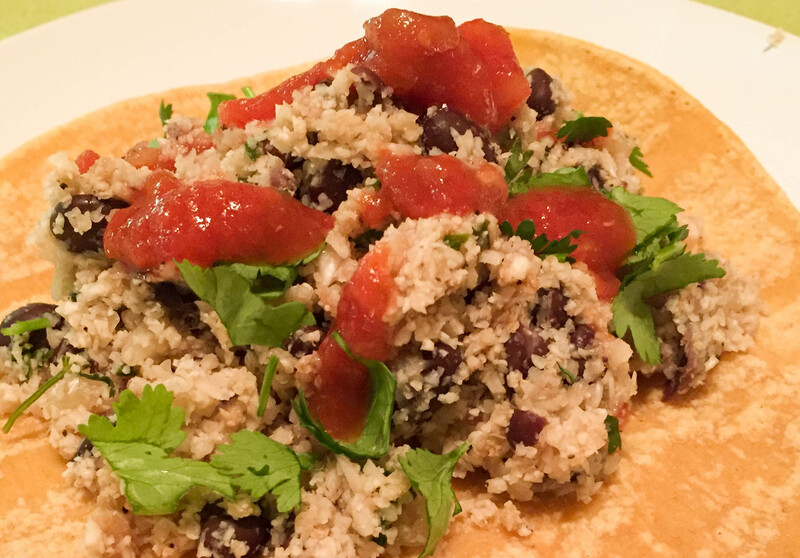 You can eat the cauliflower couscous mixture as a side dish without the corn tortilla. It would pair well with a Mexican Salad, Roasted Green Beans or Roasted Asparagus. Some diced avocado would also be a delicious topping for these tacos. We were trying to shed a few pounds when we made this recipe so we skipped the avocados to reduce the fat calories. This delicious Chopped Asian Salad recipe is a hearty, colorful, tangy and delicious asian salad with 7 grams of fiber, 11 grams of protein and your whole days’ worth of Vitamins A and C.
Asian salads are known for their unique combination of sweet and savory. Some even throw in some spiciness for good measure. This recipe has it all. The orange and agave provide the sweet. The veggies and soy sauce provide the savory. 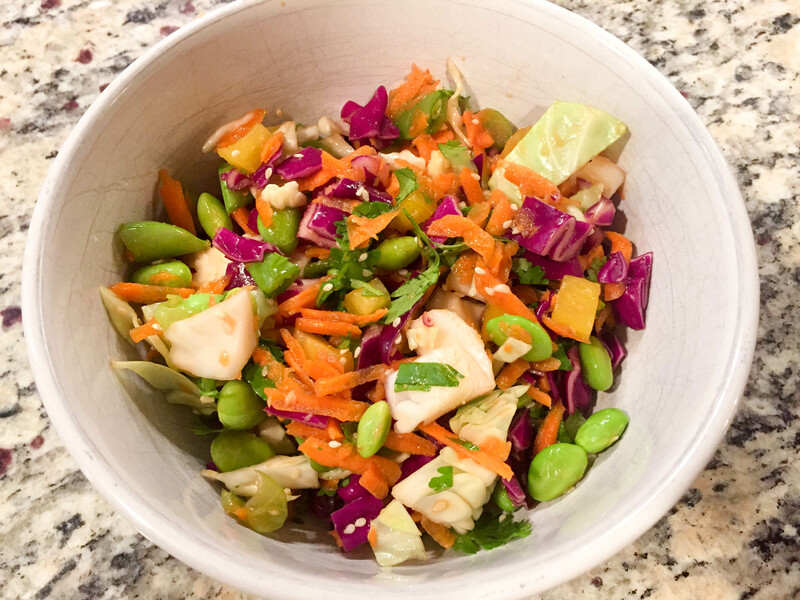 And the ginger and Sriracha give it a spicy kick that will make your tongue impatient for the next bite of this delicious Chopped Asian Salad with Orange Sesame Dressing.